Showing 43 articles from September 16, 2013. Fall razor clam season runs Thurs. - Mon. SOUTH BEND - Debbie Lynn Kelly, 55, was arrested and booked into Pacific County Jail last Thursday by the Pacific County Sheriff’s Office on four “probable cause” drug charges. Bored? Stop by the Raymond Library and select one or more from its 22,756 volumes on site – CDs, DVDs and audio books as well as hardback and paperback books. Look into the library’s many reading programs for children and adults. Photo Submitted by Sarah Frank The Raymond Fire Department extinguished a semi-truck fire before it got out of hand last Friday on Highway 101. 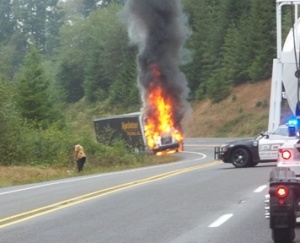 A truck pulling a trailer caught fire at milepost 60.5 (about one mile north on Highway 101) Friday morning. The Raymond Fire Department received the call at 10:24 a.m.
Photo by Sally Kunke South Bend city clerk-treasurer Dee Roberts earned the designation of Master Municipal Clerk (MMC) – the first time anyone has received that distinction in the history of South Bend. Everything Fitz at theatre Sun. 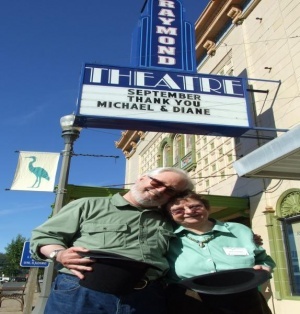 The Sunday Afternoon Live new season opens this Sunday with Everything Fitz at 2 p.m. at the historic Raymond Theatre. The Cowlitz Indian Tribe will be "Honoring the Spirit of All Cowlitz People" at the 14th annual Pow Wow Saturday at Toledo High School. The Pow Wow is a full-day event from noon until 10 p.m., and admission is free. Master of Ceremonies Don Ryan will conduct grand entries at 1 p.m. and 7 p.m. with the assistance of Arena Director Ed Wulf. Head Woman and Head Man Dancers, Kevin and Jeanifer King (Cowlitz), will be your host throughout the day and into the evening. We are proud to present Grey Eagle as Honor Drum and 206 Singers as Host Drum. More than 60 volunteers from various churches spent Saturday morning painting, power washing, weed whacking and sprucing up the city of Vader in recognition of National Day of Service. Part of projects going on around the country, as well as elsewhere in Lewis County, the National Day of Service was first established in 2002 by the Bush Administration as a way to commemorate those who fell in the line of duty while responding to the World Trade Center Attacks on Sept. 11, 2001. Participation in the event had been a first for Vader and Mayor Ken Smith, who was among those growing calluses that day, said he was "startled" to see so many individuals participating (65 in all). Hitchcock classic Lifeboat will be shown at the Historic Fox Theater in Centralia Saturday at 2 and 7 p.m. Tickets are $7 for Members, $8 for individuals or $20 for a family of 3-4 persons. For info, call (360) 807-8053. 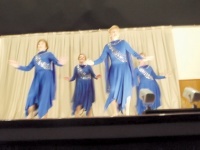 Pam Casady, Mary Cullen, Sharon Ruhl, Georgia Williams perform as a quintet of dancers during the Sixth Annual Ryderwood Variety Show Sunday. They joined acts both local and regional, including the Wrinkles Of Washington, a 55-and-older performance troupe. (Those who missed the show can see WoW perform thie December if Lacy and Olympia.) Proceeds from this, and other events, helped contribute to the Senior Services for the South Puget Sound, as well as a fund to help improve the Ryderwood Community Hall. The South Bend School District will soon receive 12 musical instruments, thanks to The Mr. Holland’s Opus Foundation, made possible by a generous grant of nearly $9,000 from the Hatfield Family Foundation. Students from the three local schools have a rare opportunity to see, hear and interact with professional musicians from the Canadian group Everything Fitz Sept. 23. The Wrinkles of Washington performance on Sunday afternoon was a wonderful treat for sure! I’ve never seen so many full chairs in our large Auditorium and all were pleased with what they saw and heard. This group has some really talented folks! The only slight (very slight) disappointment was the tap dancers couldn’t be heard on the stage’s carpeting. It would be great to have them come back. Even better, would be an opportunity to see their full show in December, either in Lacey or Olympia. The humidity has been frightful lately. It reminds me of anywhere I’ve lived, where you have to keep rice in the salt shaker so that it will shake. Rice is also recommended when you get an electronic device (like a cell phone) wet. Turn it off, remove battery and "card" if possible and place in a closed container covered with rice. It’s worth a try. Toledo Class of 1968 is raising funds to purchase bricks for the Veterans Wall, honoring classmates who gave all and veterans of limited means. A challenge goes out to all graduating classes. Contact Bill Linn, wlinn@lcc.ctc.edu or (928) 446-1580. Deadline looms: Bricks purchased by first week of October installed by Parade Day. Download form: www.toledolionsclub.org or contact Bob Schmid, dearoldbob@toledotel.com or (360) 864-8335. Our own Shirley Jones passed away on Sept. 3 of natural causes. Her life was filled with blessings. Her marriage to Oran Jones lasted for 62 years until his death several years ago, and they are survived by two children; Robert Jones and Patricia Driver, of Olympia. Our hearts go out to them as well as all of Shirley’s grandchildren, great-grandchildren, and friends that were left behind. You will be missed, Shirley. Also, we lost former resident Beverly Townsend Sept. 11. She died due to complications from a recent heart attack and stroke. Prayers go out to all of her family, but particularly long-time member of the Winlock community Lisa Townsend. 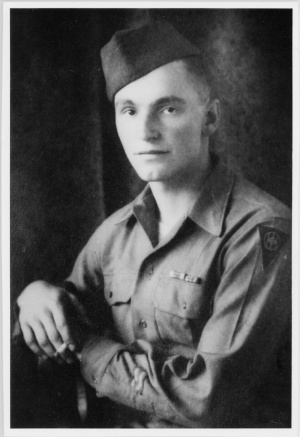 Bev was 91 years old and had lost her husband Newt, of nearly 72 years, just last year. We are sorry to lose you, Bev. It is that time of year when the various taxing districts are working on their budgets for the 2014 tax year. The budgets will be voted on and approved by each district’s commissioners at public meetings to be held in October and November. Please check the local newspapers for the times and places for these meetings. It’s that time of year when both ants and termites are in flight as they mate and search for new places to establish colonies. Termites are often confused with ants. JoniBon Stevens, 59, of Ryderwood, passed away Sept. 10, 2013, in Olympia. Services for JoniBon Stevens will be held Oct. 27 at 1:30 p.m. at the Vader Grace United Methodist Church. Arrangements are under the care of Cattermole Funeral Home, Winlock. What’s Next with the PUD #2 Rate Increase? For the past few months many articles have been written, and meetings held going through the pros and cons of power extension from Raymond, to Tokeland, and then across the Willapa Bay oyster beds, and shipping channel to Oysterville. The Washington State Nurses Association has endorsed Initiative 522, to label genetically engineered foods. Lewis County and the cities of Chehalis, Centralia, Winlock, and Morton are part of the Lewis County Coalition, which is in the early stages of cooperatively updating their Shoreline Master Programs (SMPs)The Coalition is working to ensure a regional approach to shoreline management. We encourage the active participation in the SMP update by all persons, private organizations, public agencies, and tribes that have an interest in the Coalition’s shorelines of the state. We want you to be involved in the update. Public open houses and visioning workshops for the County, Morton, and Winlock are scheduled for Wednesday, Sept. 25, at the Veterans Memorial Museum (100 SW Veterans Way, Chehalis) and Tuesday, Oct. 1, in Randle at White Pass HS (516 Silverbrook Rd.) Both events start at 6 p.m. Please visit the Lewis County Coalition’s website for current information on the update, who to contact, how to be involved, and documents to download and review. 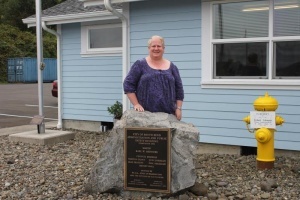 The Coalition website is at: lewiscountywa.gov/communitydevelopment/shoreline-master-program-update. A successful sales campaign by the City of Winlock appears to be netting the city some success on eBay. Since last week, a row of surplus city vehicles (pictured) has been on display across from Cedar Village IGA and, as of press time, all items appear to have obtained bids of at least $700, with the highest at $1,800 for the street sweeper (furthest left). Bidding is expected to close around Wednesday morning and those sill interested in viewing the lots can do so by searching for the username Citysurplus98596. Proceeds will be allotted to the departments to which the vehicles originally belonged. A public hearing on Ordinance 1008, a moratorium on recreational marijuana production and sales, was held during a recess at the Sept. 9 Winlock City Council meeting. Fourty-three pages of Washington Administrative Code (WAC), a State Liquor Control Board statement, and City of Morton's Ordinance 2013-01 were included as reference guidelines for establishing Winlock's moratorium, which passed unanimously. Visiting Charles Wright Academy fought back from a 13-point deficit and scored from 1-yard out with 90 seconds to play to defeat Raymond 28-21 Friday night. Battling mosquitos and runners from 13 schools, local runners competed on the 2.95 miles course at Ocosta. Battling mosquitoes and runners from 13 schools, local runners competed on the 2.95 miles course at Ocosta last Saturday. 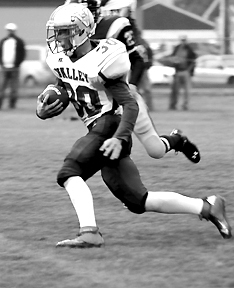 Photo by Larry Bale Valley tailback Seth Flemetis rushed for 207 yards on 23 carries and 2 touchdowns and also led the Vikes on defense with 17 total tackles. Willapa Valley opened the volleyball season with a 25-14, 25-20, 25-17 win over visiting Pe Ell Thursday night. During the first games and meets of the year, coaches have a lot on their mind starting with how their athletes will compete. 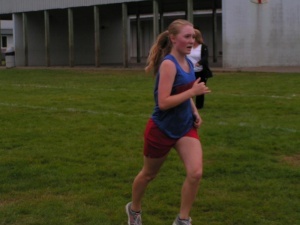 For the Toledo/Winlock Cross Country team, Coach Brian Layton had to be pleased during the team's first meet at Lewis & Clark State Park Wednesday. The local harriers placed six runners in the top 16 of a 55-person race and dominated five other teams from around Western Washington. The vaunted Toledo defense couldn't close the deal on Friday as Columbia (White Salmon) scored 14 unanswered points and slipped by the Indians in Trico League play. Taylor Hicks led Toledo in rushing with 92 yards while Kreed Askin added another 73 yards on the ground. Gage Madill went 2 for 3 for 58 yards passing including a 53 yard TD to Connor Vermilyea. The Indians will host Forks this week in a non-league contest. Victor J. Hobbs, 24, was contacted on the 600 block of Main St. at around 5 p.m. in response to reports of an individual yelling and wandering in and out of traffic. After interviewing the suspect, he was booked for possession of methamphetamine as well as an outstanding warrant related to second-degree criminal trespassing and resisting arrest. A big ‘Thank you’ card! The Northwest Carriage Museum invites you to the Fifth Annual Oktoberfest on Saturday, September 28th from 5-8 p.m. 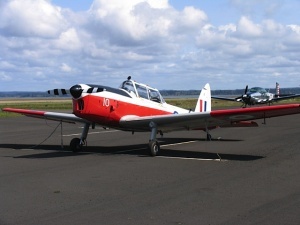 Oyster Feed & Fly-in Sat. Sunday Afternoon Live will open Season 11 early to accommodate school schedules for members of Everything Fitz, a lively, high-steppin’ dance and fiddlin’ Fitzgerald Family troupe from Canada who last captivated local audience members in 2008.